Much like Phantasm III, TMNT II: Secret of the Ooze is a perfect example of what happens when the studio executives have more power over a film than the actual creators. While the original TMNT film was a near-perfect adaptation of the Mirage comic book series with only a hint of the cartoon, TMNT II draws nearly all its inspiration and atmosphere from the animated series, resulting in a very kid-oriented film that doesn’t withstand the test of time as admirably as the original. Following their showdown with the Shredder and the Foot Clan, the Teenage Mutant Ninja Turtles (Leonardo, Raphael, Donatello and Michealangelo) are kicking back and scarfing pizza. However, the Shredder has survived, albeit brutally scarred from being crushed in a dump truck, and quickly rebuilds the Foot. Dr. Jordan Perry (David Warner), an employee of the TGRI chemical production plant (the same plant which created the ooze that mutated the TMNT) is taken prisoner by the Foot and forced to create two new mutants for their devious schemes. The result is Tokka and Rahzar, a super-strong snapping turtle and wolf duo who have the brain-power of infants. Now the TMNT and their new pal, Kino, have to figure out a way to take down the Foot once and for all. By the time TMNT II was in production parents in the early 90’s were throwing a fit over the violence seen in the Ninja Turtle media, particularly the first movie. As a result of picketing soccer moms, several changes were made to the film. For one thing, the TMNT were not allowed to use their weapons on any of the Foot Soldiers, resulting in them barely using their weapons at all. Or, in Mike’s case, his nunchakus were completely forbidden. To go off on a tangent, Mike’s nunchakus were the source of much controversy as they were considered too violent a weapon, which lead to them being edited out of the cartoon series over in Europe and eventually removed from the show all-together. Then there are the two new mutants on the block, Tokka and Rahzar. They look fantastic, sure, but their threat-level was virtually neutered by the decision to make them “babies”. As a matter of fact, original plans were for the film’s evil mutants to actually be Bebop and Rocksteady (Shredder’s lackeys from the animated series), but creators Kevin Eastman and Peter Laird managed to put their collective feet down and keep the pair of mutant numbskulls out of the film. And there’s the TMNT’s new human ally, the kid-friendly Kino. The absence of their previous human friend, the ultra-violent Casey Jones, is sorely felt in this film. While the actor who played Kino is without a doubt a very talented martial artist, his presence is more-or-less annoying. There are a few upsides to this film, though. The special effects provided by Jim Henson Studios are a major improvement over their work in the first film. While the lip-syncing isn’t perfect at least you can no longer see the mouths of the actors inside the suit behind Don’s teeth. Tokka and Rahzar are also a visual achievement, looking incredibly menacing despite their meager intellects. Super Shredder (portrayed by pro wrestler Kevin Nash) also looks phenomenal, though he can only be seen briefly at the film’s climax. Another major improvement is the fight choreography. In the first film, the Turtles mostly just round-house kicked everybody and looked very stiff and clunky. The martial arts have undergone a major upgrade, with the Turtles moving a lot faster and acting more flexible. While the fighting still has a lot of cartoonish sight gags and annoying improv-comedy, when they’re actually fighting they’re really quite convincing. However, not even the presence of one of my favorite character actors, David Warner, can overcome possibly the biggest and most memorable flaw of TMNT II: Vanilla Freakin’ Ice. The entire “Ninja Rap” sequence at the night club is downright embarrassing. The inclusion of Vanilla Ice is virtually unforgivable and he’s left a stain on the franchise that can never ever be erased. To this day, when many people think of the Ninja Turtles, they think of the Ninja Rap. God dammit. 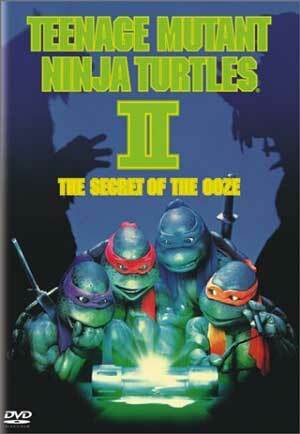 While it does have its entertainment value, TMNT II still has too many noticeable studio-mandated alterations. The pop culture, the *bad* pop culture, also dates it terribly and not in an endearing sort of way. I have to give the movie a C-. Perhaps if it wasn’t for Vanilla Ice I could have rated this movie just a little bit higher. And lets be honest: Corey Feldman was a much better Donatello.